Hace muchísimos años –pongámosle unos cuantos miles, año más, years less-a nest egg rolled, slid down the steep slope of the mountain, dodged a couple of bushes, bounced off a ledge and ended up forgotten, almost forever, in a murky and hidden crack in the hillside. Murky enough so that the sun's heat could not help incubate and hidden enough so that nobody could ever find. So there it was the egg, hidden in the dark in a hole on the side of the mountain, as I said, almost forever. Because as you have guessed, if the egg still continue there, this story probably would end soon. After all, an egg hidden in a crack can not pass anything interesting. So was that a few thousand years later, precisely on Saturday around noon, just in a storm, the hole where it was the egg began to flood. And much rain got inside, the egg began to float. First just a little, then a little more and then began to move about water seeping through the crack and floated to get stuck on a rock, half concealed in a pasture. Yes, what is said camaraderie, was camaraderie. After so many thousands of years the water had been good, because I was pretty filthy. But for when the storm subsided and the sun rises, the shining egg that was a pleasure, almost like a rainbow, but well-violet. As you suspect, this egg from which I speak is not much like the one would keep in the refrigerator. As the violet, basically. In short, abbreviated. The storm had cleared completely and the heat of the sun was hitting half strong, when Zonzo just went out there, I was looking for somewhere with a small shadow to lie down for a nap and suddenly saw something shining semi oval next to a stone, half concealed in a pasture. Well, better not to think about, or the blaze that took off what was inside the egg, or how Zonzo barked when he singed whiskers. - Ahhhhh! Zonzo cried. - I burn, I burn! uncomfortable silence ensued, during which they both looked very closely in the eye without making the slightest movement. "What a strange lizard" thought Zonzo. Zonzo barked again, and so that the lizard (which it does not look much like a lizard) will be clear who was boss. Then she came out of the shell and spit a little fire between his legs, so that the egg-weird-loud-and-hairy Zonzo I mean, it became clear he was not going to leave so easily frightened. -Che, terminal fire Zonzo said, putting his feet in a puddle that had formed with the rain a while ago. "Okay," said the lizard. "But shut up, because I bristle scales tail fuss. - What do you want to have? Pens? The dragons have scales. - Dragons? Zonzo asked amazed. - Why do you repeat everything I say? "You're goofy, you? "Said the dragon a bit annoying. "Yes,"
Zonzo. "I'm Zonzo. How did you know? "We knew us from somewhere else? I do not think. I just left inside the egg, do not you remember? And you are? Because to be an egg you have too much hair. Also do not see you're scaling and very noisy. "I'm not an egg I'm a dog, "explained Zonzo half offended. -Ah. Why are you doing so much noise? Asked the dragon. "It is called" make noise ", is called bark. 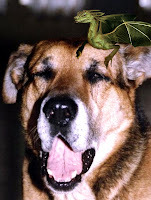 Ladro because all the dogs barked, "said Zonzo and definitely annoyed by the ignorance of the dragon. - And why they bark? "She insisted. Why not if they know that dragons are never conform if one does not answer your questions. -Ufa. I do not know. We bark period. Now, if you do not mind, I'm going to take a nap under that tree, that's why I came not to talk to lizards chatterbox-ay! I singed legs again! -Is Zonzo complained. "Excuse me, gave me a dragon coughing, laughing lied to in while Zonzo grumbled away to the shade of pine to see if once and could get some sleep. "Okay, I let you sleep. But first explain to me how to get to the castle from here, "she said. - Castillo? Here there is no castle Zonzo yawned as he gave the fifth round in the same place before bedtime. princesses," he said, supporting the base of the muzzle on the legs straight. I do not understand. And what do the dragons living in this place? She asked, puzzled. Zonzo. "To my knowledge there has never been dragons here. At least I never saw none. I did see many lizards in the mountains, you sure you're not a lizard? "Better that I am not a lizard, eejit. I am a terrible and dangerous dragon, do not you see? But now I do not know what I do, because dragons work defending the princesses who live in castles. And here there is no castle or princess. "Now I remember, the day of spring we had a princess, but was not from here, was of Bahia Blanca. Maybe there is a castle. Why do not you go and leave me sleep easy step, "suggested the dog. - Is not me? " "Said the dragon getting pretty voice. "I was going to take a nap," growled the dog. Zonzo argued in a last attempt. But when the dragon sighed, deeply distressed, the poor are resigned "Well, come on, is fine. I'll walk. "The truth is that to believe a terrible and dangerous dragon, this lizard is very annoying," she thought as she stretches Zonzo and began to walk toward the station. -The train passes a while now. Here you go up and do not you get off at the station until General Roca. From there are about two blocks to school ... Are you listening? Asked the dog. -Ehh ... You told me how's your brother? He hesitated a dragon. "Bonzo" said Zonzo for the fifth time. - And Bonzo will be able to tell me how to get to the castle where the Princess? She insisted again. I do not know. But if Bonzo does not know, nobody knows. It is a very intelligent dog my brother. It is the only family that goes to school. There he learned many important things, so must have learned something about dragons Zonzo said, he was very proud of Bonzo. - Why do not you take the train and escorted me to Bahia? I have fear of losing, "said the dragon. "No, no, yes-no Zonzo is interrupted. "And you can not miss miss, is straight from the station, there is no way of getting lost. -Dale, come with me and the way you see Bonzo "she insisted. Zonzo The truth is that I had really wanted to go to Bahia Blanca, but the idea of \u200b\u200bseeing his brother disliked, because she missed him a lot. So, without much thought for not repent, he boarded the train, gliding up a good nap. - Are we there yet? Asked the dragon. -two minutes less than two minutes ago when you asked me the same thing for the hundredth time, "said Zonzo mufado. And the dragon it was quite rotten, because I had been wondering "how much longer?" And "Are We There Yet?" Even before boarding the train. So when the car finally stopped at the station, the poor dog, who was unable to sleep or nap thirty seconds, sighed with relief. -Dale, we will look for your brother. I can not wait to get to the castle, the dragon was excited getting on the back of Zonzo and spurring like it's a horse. "With how calm I was there in Sierra. Bonzo had better give me a leg to get me off this lizard "thought Zonzo. Between us, luckily Zonzo addition was half good-natured goofy, because in fact the dragon was not too terrible or too big to say, and if he had wished it could habérsela eaten in one bite. When they reached the school gate, the two noticed the little big problem had to solve. would answer the door opened and a woman in blue overalls were told to pass. "Strange," said the teacher. "I could have sworn I saw you recently in the courtyard, Bonzo. When you left you? But after let them shut the door and walked down the hall to the classroom where students were waiting, without much concern for Bonzo, ie, Zonzo. -Ufs, I almost see, "said the dragon, which had been hidden under Zonzo ear. "Not that I'm afraid," he explained. "But it would have been terrible to have to attack when she screamed telling everyone that there is a dragon inside the school. "Sure, sure," said Zonzo, actually a lot did not believe him, because he felt shaking all the time under your ear. "Now we have to find Bonzo. Where is he? The dragon made a face of "this dog can not be more goofy"
- Did not you hear the teacher said she saw you on the playground? He asked. - Who? Me? But if I was out with you ... Zonzo replied. "No, goofy, Bonzo. She mistook you Bonzo, did not you see? She said she had been sleeping on the patio. That's where it should be your brother in the backyard. Come on, come on. Just then the bell rang for recess and a din of kids started running and screaming out orderly and quiet of the classroom. the shock, the dragon turned to hide behind the ear Zonzo. "Miss," said a girl. -A Bonzo came under fire one ear. - Did you see, Martin? "I said Agnes to the other goalie. "Bonzo came to ask for food again. With everything that I had not eaten today to request more till tomorrow. -Leticia, we will have to do something with Bonzo, it might not install all the time on the stairs of the hall bath to ask the kids cookies, "said Isabel. "But if I saw a while ago and was sleeping peacefully next to the stage," replied the deputy. - ister, ma'am! Bonzo has a green tick! "Stop, sit in your place and stop inventing nonsense. Meanwhile, two dogs and the dragon talked to solcito Zonzo in the courtyard and he explained to his brother who needed his help to find a princess and a castle. stared Bonzo the first one and then another, until finally he said: "It will not be able to be. Here we do not have castles, least of all princesses. Bay girl here, but not a real princess. Princesses and castles as you need this dragon is only in fairy tales, not in real life. The dragon, which she did not feel so bad and so dangerous, but a little sad, began to runny. "Well, no big deal. Do not get wrong, "said Bonzo a bit shaken. "I think I know someone who can help. Miss Paula knows a lot of stories, capable in the library where she works, we can find a story that can get you. I do not go much out there because Paula does not have cookies, as the kids first and second, that are bringing more and more goodies they invite, but we can go to look if we find something that works in the library. So there you were. And Bonzo was right, there were cookies, but books ... ufs ... had books of every color. - And in what I get? Asked the dragon. "Right," said Zonzo (which although it did not read the understanding) and opened a book either in a random page, so bad luck, the dragon landed right in the story of The Three Little Pigs. And if anything characterizes the dragons is that they are enthusiastic and well led and they alone, she was just there to blow on par with the wolf, forgetting that in addition to smoke from his mouth came fire. also reacted quickly and opened the book for the dragon could hop out before the wolf and the three little pigs, which had the face of very few friends, achieve it. "In this tale does not fit very well," said the dragon all stirred by the fight. "I'd better get into this one. And before I could Bonzo tell him that no, that there either, the dragon had already jumped in a book that covers Razul said Red Riding Hood. -understand ... "said the dragon resigned and weeping as he walked away. But then the wolf, which basically was not so bad, felt a little guilty for having mistreated, sighed deeply, and while the trunk is camouflaged behind shouted, "Look, I'm no expert on dragon, let alone ... But it strikes me that you could try your luck with Flori, Ataúlfo and the Dragon. Imagine, is on the bottom shelf. that the book also served, but did not give me the time-challenged Bonzo. - What about your brother? Asked the dragon. -is standing guard at the door, if he returns, "said Bonzo Paula. -Wolf recommended that I try with a story that is on the bottom shelf, "she explained. -Mmm ... The Princess, the Knight and the Dragon. Is this? Bonzo asked while poking with his nose between the spines of the books. opened the book and when the dragon is put in just went to stop in the middle of a scene in which the knight faced the fierce dragon to free the princess from the tower. The three characters stood still watching her. - Agh! Yuck! A lizard! "Said the princess. "No fear or worry my love," said the gentleman. "The crush with my shoe. "I'm not a lizard," protested the dragon. "I'm a terrible and dangerous dragon, do not you see? From time to laugh, almost fierce dragon story grabs an attack of hiccups. The princess burst into laughter and the knight is tempted as he dropped the sword. - But if you measure less than six inches! "Said the dragon. "He's right princess, you're a lizard. Outraged, the dragon spat a good breath of fire. "Well, okay, in any case will be a fire-breathing lizard, but terrible and dangerous, you do not have anything," Knight said recovering a little fit of laughter. "I could crush you with your shoe, would require even use the sword. The Dragon, hurt, left the story hitting a bang (or a tapazo, which for that matter) and sat on one of the tables in the library. His face was all red in anger. - Have not worked? Asked Bonzo. "Maybe this was not the wolf that ventured said Bonzo. Zonzo Just then barked to alert someone coming to the library. Bonzo and the dragon is hiding behind a cupboard. Miss Paula had in hand a big and very heavy book. He left on the desk and went out again, making a mime Bonzo, who was actually Zonzo in the head. "Strange you here, Bonzo," said Paula. "Stay if you want, now I return. just came out, the dragon and the two dogs came to the desktop. And seeing the picture of the cover of the book to three came up with the same idea. "This is definitely your story Zonzo said that although he could not read could see from the drawings that the dragon Justito wore in the book. - you dare to get in there? Zonzo asked. "Better," said the dragon. And without hesitation he said goodbye to the dogs and plunged into the story to come out ever since. on the desk, opened the heavy book he had brought Shrek a while before and started looking for a good image to work with kids in fifth, who had seen the film last week.